Part 1 offered an overview of the entire paper and what to expect in coming blogs, as well as some brief background on wax coating and typical operating speeds and coating weights. Part 2 went through improvements that have been made in roll and web handling, closed loop moisture control, and pre- and post-heating and cooling. Part 3 will wrap the series up with an explanation of recent drives and controls, coating application methods and design, and a brief conclusion. The increase in speed has been aided by advances in drive and control systems. 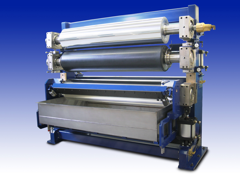 Features such as more accurate closed loop tension controls have made the handling of the web at the higher speeds much easier, particularly at the Unwind and Winder. Tighter speed regulation has also assisted in the ability to control the web at the higher speeds, particularly between the pre-heat/cooling rolls, coater and post-heat/cooling rolls, where the quick transition of the web from one section to the next precludes the ability to incorporate tension control hardware. Advances in the drive and control system have also aided the ability to reduce the coating lay-down. Tighter speed regulation has allowed for better control of the coating rolls, resulting in better control of the lay-down which results in the ability to reduce the coating application rate. Key to the waxing line is the method by which the coating is applied to the web. The older coating lines typically featured gravure or kiss coaters to apply single-sided wax. These coating methods had limitations in speed and minimum coat weight. In an effort to reduce the coat weight the use of reverse-roll coating was considered but this too was speed limited. In an effort to increase the speed and reduce the coating lay-down, multi-roll coaters such as the unit shown in the photo below are being provided. Coaters such as these allow for the coating to be picked-up from a pan or out of a pond and drawn down by each roll-to-roll transfer, with each successive roll running at a higher speed. The use of roll coaters such as these allow for the smooth, even drawdown of the coating to extremely thin amounts as well as the application to the web at elevated speeds. Included in a system such as this are several features designed to assist in the application of thinner coatings at higher speeds. The pan which holds the coating is provided with precise temperature controls to maintain the coating at the desired temperature. The rolls are provided with minimal run-out to allow for more accurate coating distribution. The rolls are internally channeled to allow for fluid passage for precise temperature control. Roll crowning is included to compensate for deflections caused by roll weight and nipping forces. Each roll features a low backlash drive transmission assembly to interconnect it with an independent motor and high accuracy drive as discussed earlier. Precision gap adjusters are provided for setting the roll-to-roll gap or footprint. In addition to the above features many of today’s wax coaters are designed to allow for direct interfacing with on-line gauging systems so that the coating lay down can be continuously monitored and adjusted through the drive and control systems. There has been much advancement in the design of all aspects of the wax coating system to allow for the application of thinner coatings at higher speeds. The above information touches upon several of the major advances in a very general way. Of course, there are many other changes that are or can be instituted to help achieve the goals of thinner and faster which are not covered in this document. As discussed earlier, we have focused on these advancements as they relate to the application of single-sided wax coatings. Most of the areas discussed above directly translate to two-sided wax coating as well as laminating using wax. We have only covered some of the advancements made in the equipment used to produce wax coated papers. We have not discussed the advancements that have been made in the wax coatings that are being applied to aid in the goals of thinner coatings at higher speeds. We would like to acknowledge The International Group, Inc. (IGI Wax) for their assistance in preparing this document.